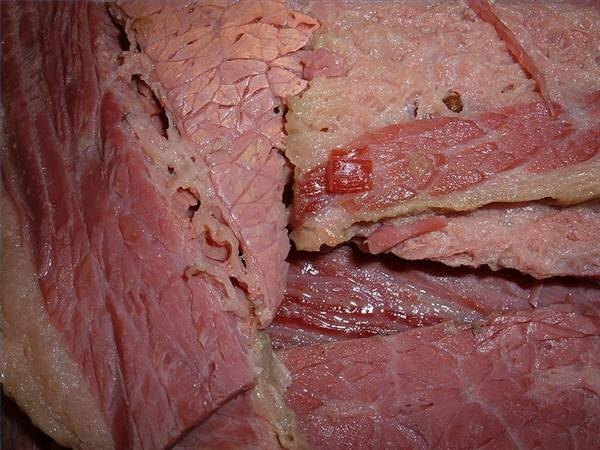 Corned beef, whether served with cabbage or potatoes, is a traditional way of cooking a large cut of beef. The time to prepare corned beef takes several days, so plan ahead. Just think of all of the sandwiches and hash you can make when it's done. Put the 1½ qt. of water in a large stockpot and add the salt, sugar, pickling spices and saltpeter. Cook over high heat until the sugar and salt have dissolved. Lower the heat and stir in one bottle of the beer. Add in the ice, and stir the brine until it has melted. Place the brisket in a large zip-top bag and pour in enough brine to thoroughly cover it. Squeeze all the air out of the bag and put it in the refrigerator. Turn the bag daily and check to make sure it is still covered with brine, for 7 to 10 days. After 7 to 10 days, remove the brisket from the bag and rinse under cool water. Place it in the stockpot with the mustard seeds, black peppercorns, allspice, bay leaves, onion, carrot, celery and one bottle of beer. Add water to cover. Bring the water to a boil, and then reduce the heat to low. Let the meat simmer for two to three hours or until it is fork tender. Remove from the stockpot and allow to cool. Cut across the grain of the meat, carving as thin of slices as possible. A simple step by step guide to making a traditional corned beef accompanied by photos and instruction.